This is just a recap of something God revealed to me about a year and a half ago. 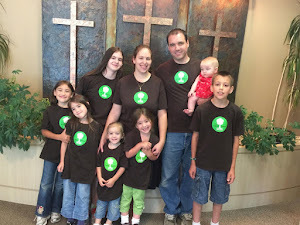 At the time, our Care Group was studying the book Living the Cross Centered Life by C.J. Mahaney. I was reminded of this revelation the last time I was at Care Group and thought it might be beneficial to share it here. I'd recommend reading the article if you want to understand my reflections upon it. Just cut and paste it into your browser if you want to read it. Wow! I was just like that man—rebelling against God and not caring to be reconciled. Yet, God had mercy on me! I certainly didn’t think that this morning—I lacked compassion for this man and I was feeling very self-righteous. However, God has used this news story to open my eyes to what I was before Christ and the great undeserved grace that He has bestowed on me. And you know, now…I might just pray for that man—because he is exactly what I was before Christ opened my eyes and delivered me. "Therefore you have no excuse, O man, every one of you who judges. For in passing judgment on another you condemn yourself, because you, the judge, practice the very same things." 1 “Judge not, that you be not judged. 2 For with the judgment you pronounce you will be judged, and with the measure you use it will be measured to you. 3 Why do you see the speck that is in your brother's eye, but do not notice the log that is in your own eye? 4 Or how can you say to your brother, ‘Let me take the speck out of your eye,’ when there is the log in your own eye? 5 You hypocrite, first take the log out of your own eye, and then you will see clearly to take the speck out of your brother's eye. When we are aware of the great sin debt of which God has forgiven us, we are so much more apt to have compassion on and forgive others of the much smaller debt which they commit against us. There is probably no greater depiction of this than Christ's parable recorded in Matthew 18: 21-35. May each of us be more aware of our sinfulness that we might be more aware of God's rich grace toward us causing us to extend that grace to others and forgive from the heart. I'm using David's account to say, "Congratulations, my love, on your very first deer! I knew you would get one!! Happy Birthday!! I love you, handsome!!! Please wash your hands before you hug me though :P"
"And God blessed Noah and his sons and said to them, 'Be fruitful and multiply and fill the earth. The fear of you and the dread of you shall be upon every beast of the earth and upon every bird of the heavens, upon everything that creeps on the ground and all the fish of the sea. Into your hand they are delivered. Every moving thing that lives shall be food for you. And as I gave you the green plants, I give you everything" (Genesis 9:1-4). Happy Thanksgiving! Today was my first day hunting. Gabe and I went out at 5:30 and was on the field by about 6:30. The sun rose around 7am and moments later here I am coughing up a storm in the woods. That was something I was not prepared for! I thought it would scare away the deer, but around 7:10 or so I so a flicker out the corner of my eye. On Gabe's side of the mountain was a deer, about 100 yards out. This is what I've been training for, 100 yard targets! I line up the deer broadside in my sights and was trying to get Gabe's attention to see if he could get the shot, it was his side of the mountain and all. No answer from gabe and here I am debating on taking the shot. What would you do if it was you? Take your friend's deer as your first kill, or let him take it? Well I was going to let him take it, until about a minute later when the deer ran off into the woods leaving neither one of us a shot. Later after leaving, I found out that it was a little buck, and Gabe couldn't get a shot from the angle he was at, and here I am trying to be the good guy and let him have it. Well now we know for tomorrow, if we get the shot, we take it. If it ends up with two bullet holes in it, oh well! Either way, I had a great time enjoying God's creation while watching and learning about deer. Maybe tomorrow, I can learn about the inside of the deer and how it tastes. I hope everyone else is having an awesome day as well! Have a Happy Thanksgiving, and my wife posted before me because I was out "playing". P.S. All hunting is done legally, with required licenses and permission from landowners. I don't kill for fun, but for food. If I made enough money to buy it from the store all the time, I would! Where to begin??? I'm most thankful for God sending His one and only Son to die on the cross for my sins and for His opening my heart to receive His gift of eternal life by the blood of Christ. Next, I'm most thankful for my godly husband who is out working hard to get some venison on his day off. :D Then, I'm thankful for my precious children who are getting into all kinds of things while I work in the kitchen. I'm also thankful for the rest of my family all over the country with whom I'm missing sharing the kitchen work and fellowship :P I'm extremely grateful for the church family that God has given me with which my husband and I are able to grow. I praise God for the honesty, transparency, and courage with which our pastors and leaders teach Biblical truth. And I'm grateful for our dedicated care group leaders...I think I speak for David too when I say that they truly are our best friends and part of our family. And then there's everything else...our warm house and clothes, great food, etc. etc. etc. God has been so faithful to our family! His grace, lovingkindness, and faithfulness are much more than I could ask for, hope for, or even imagine. This is where my focus needs to stay...on God...what He has done and is doing all around me. May your focus also be on praising and thanking God on this special day set aside for thanksgiving. May you have a blessed holiday! 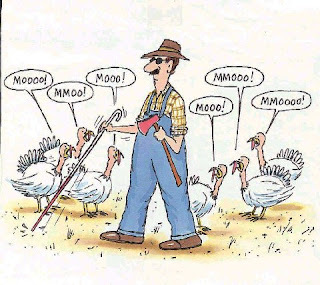 And if you can't think of anything else to be grateful for...at least you're not the turkey or this poor guy!! Q: What Do Naptime and Silicone Have in Common? A: One cute toddler and one mischievous preschooler. So our dear son was trying to feed this precious wee one silicone today. Fortunately, he isn't very good at feeding infants. However, he was fairly effective at getting it all over her hair and the side of her face. Not to worry, the doctor said it will come off with Mineral Oil...eventually. I was trying to think of a way of describing our day yesterday, but to say the least... A Picture says a thousand words! It wasn't all that bad, Matt's little escapade was only at the end of the day. We got to share in good fellowship and a great sermon from our Pastor, Steve Teter. Enjoy the picture, and may God Bless you all.